“If you wish to elevate yourself as a legal professional, you must embrace the collective philosophy- champion the cause of the masses, the human rights of the voiceless and those without means”, remarked Chief Justice Dipak Misra on Saturday. 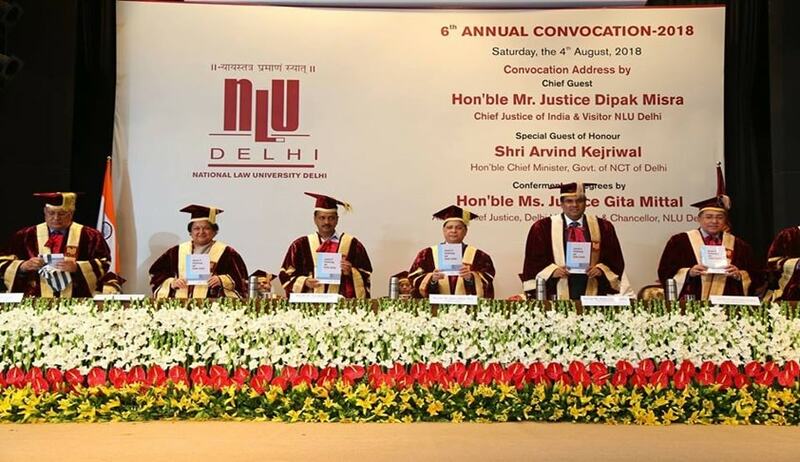 Speaking at the 6th Annual Convocation of the National Law University, Delhi, the judge encouraged the aspiring lawyers to devote a part of their careers to “cause-lawyering for the poor and the downtrodden”. To mature in their roles as lawyers, judges and administrators, he urged that it was obligatory that one familiarise oneself with the undercurrents of the social diversities and disparities, to be able to correlate the law and the social impulses so as to bridge the gap between legality and the reality of the society. The Chief Justice asserted that the success of the professionals who “take along the deprived section of the society” shall be measured higher than those mining the financial and economic pursuits exclusively. Stating that the welfare and the good of the people is the supreme law, he spoke of the dispensation of justice as enshrined in the Constitution. “...justice in its connotative expanse engulfs the liberalism of an ocean, the magnanimity of the Sun, the sternness of a mountain, the simplicity of a saint, the austerity of a Spartan and the humility of a river”, he recited from his judgment in National Council for Teacher Education v. Venus Public Education Society (2012). Emphasising that the means determine the ends, the Chief Justice iterated that the aspiring legal professionals abstain from attempting to “be successful anyhow”. “The precepts of the law are these three- to live honourably, to injure no one, to give everyone their due”, he quoted. Regarding the legal profession as one of nobility, he advanced that lawyers hold a sense of aristocracy in the society and that this self-acquired aristocracy must be used expeditiously. “Although the entry to the profession can be had by acquiring merely the qualification of technical competence, the honour as a professional has to be maintained by its members by their exemplary conduct both in and outside the court”, the Chief Justice read the apex court’s observation In Re: Sanjiv Datta (1995). On Saturday, Chief Justice Misra noted that in empowering the masses and sponsoring growth and development of the society, legal education assumes a significant role in the contemporary world. “The interface between the judiciary and the academia is extremely important and needs to be further strengthened. The contribution of the academicians is very important as they have the ability to kindle new thoughts and ideas”, he elaborated. Rooting for an “atmosphere of intellectual affinity which survives on the foundation of appreciation and understanding”, he insisted that a deliberation on the same employ the concept of objectivity to realise one’s limitations. This, the judge said, is not a transgression but a step towards studious progression. He mentioned how the journey of legal education in India has been filled with challenges and how there has been no looking back since the inception of the national law school at Bangalore. Stressing on the need for quality legal education, he recommended that the law universities train the next generation of lawyers to meet the challenges in a “globalised, connected world”. “That is why today we speak of globalisation, global education and global understanding, apart from global warming”, he added in a lighter vein. Shri Arvind Kejriwal Chief Minister, Govt. of NCT of Delhi was the Special Guest of Honour, and Justice Gita Mittal, Acting Chief Justice, Delhi High Court and Chancellor of NLU Delhi conferred the degrees upon the successful students of BA.LL.B. (Hons. ), LL.M., and Ph.D scholars. Apart from this, gold medals and cash prizes were awarded to students of B.A.LLB. (Hons), and LL.M. programmes. Notable awardees were Ms. Kanchan who was awarded seven Gold Medals and three cash prizes, Ms. Yashika Jain received 4 gold medals, and one cash prize. Ms. Kudrat Agarwal was awarded with four Gold Medals. In all medals were awarded to the LLB students. Two gold medals were awarded for LL.M. In his Welcome Address, the Vice Chancellor of National Law University Delhi, Prof. (Dr.) Ranbir Singh welcomed all the dignitaries, graduating students and their parents and all other invitees. Since this is the 10th anniversary of the establishment of the University, Prof. Singh highlighted the landmark achievements of the University in the last decade. He stated that the highest goal of the university is to make its students worthy members of the society, imbued with the spirit of the constitution and with kindness and humility towards all. He stated that it was a matter of pride that NLU graduates have excelled in all fields, including in judicial and civil services examinations, and in securing prestigious scholarships for higher studies and in securing employment in top law firms across the globe. Many work as judicial clerks with the judges of High Courts and the Supreme Court, and several have also started their litigation practice. The Vice Chancellor mentioned that in this short span of time since its establishment, the University has achieved an NAAC score of 3.59; has been conferred a Category I autonomy status by the UGC, and is ranked no. 2 in the NIRF Rankings. The University has created more than 300 lectures, available for free, online. The University also has 10 MOOC programmes, available for free online, which has already seen enrolment from more than 5000 students. The Vice Chancellor stated that NLU, Delhi is known for its research, with 14 active research centres, and several research projects. The University is regularly consulted by the law commission of India, government ministries and the courts, amongst others. The University has a National Academy of Law Teachers for training of law teachers, which has trained more than 600 teachers. ‘But’, he said, ‘for NLU, Delhi the best is yet to come. Being the number one law school in India is too small an aim for NLU, Delhi,’ he said. ‘We hope to compete with the best of law schools across the globe.’ He also made a special mention of the Registrar, Prof. G.S. Bajpai’s contributions in the successful implementation of the e-pathshala project.